All class materials are provided by the instructor. There is a $50.00 supply fee at due at the beginning of Spring 2019 semester. Checks should be made out to Art instructor. Payment can be submitted as cash, credit card, or a check made payable to the Monthaven Arts & Cultural Center. 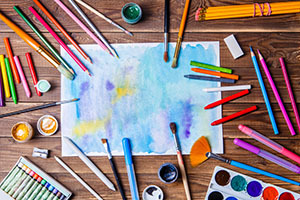 Art courses offered by The MACC are a series of lessons designed to develop and increase an individual’s knowledge, practice, and skill level in a specific art medium or art style. Our Art courses are comprised of 2 semesters. There is a Fall semester and Spring Semester. The Spring semester begins January 7, 2019 and ends May 20, 2019. At the end of the course, The MACC holds an art show and reception displaying the student’s artwork and presents certificates of course completion. Please note there will not be art classes held on any major holidays or Fall Break (Oct. 8-12, 2018) and Spring Break (March 25-29, 2019). Our Art courses are comprised of 2 semesters. The first Semester takes place in Fall, beginning August 13, 2018 and ending December 21, 2018. Spring semester begins January 7, 2019 and ends May 20, 2019. At the End of the Course The MACC holds an Art show and reception displaying the student’s artwork and giving out certificates of course completion. There is a $50.00 supply fee at the beginning of Fall 2018 semester and another supply fee due at the beginning of the Spring 2019 semester. For a Full course, Semester classes, art classes, or workshops, please make all payments (Check, cash, or credit) payable to Monthaven Arts and Cultural Center. To secure your spot, full payment must be received at time of registration. I understand that supervision will be provided during class hours. I release any person working in this program and agree to indemnify and hold harmless the City of Hendersonville, Monthaven Mansion, Monthaven Arts and Cultural Center, its staff, board members and all other persons involved with the program for any liability they have to me or my child for any injury received by my child while participating in this program. I agree to pay the one time non-refundable supply fee due at the first day of class. I also agree to pick up my child promptly after each class. Failure can result in the child’s dismissal from the program and additional charges. I understand that the Arts After School Program follows the Sumner County School calendar, meaning anytime that school is canceled, so are art classes. Make-up classes are scheduled for all cancellations excluding the observance of federal holidays. With my signature, I have read and agree with all of the above. To receive a refund for cancellations, you must give 48 hours notice unless otherwise noted. All information including but not limited to instructors, dates and fees is subject to change without notice.